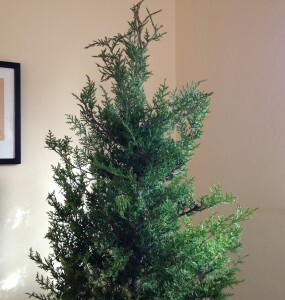 Drought Shrunk our Christmas Tree! If you are a fellow Californian, you know that the drought has affected many parts of our daily lives. From installing water-saving shower heads and low-flow toilets, to watching our lawns and gardens slowly die, it’s been pretty discouraging sometimes to navigate these no-water years. This winter, thanks to El Niño and some regular old rain, things are looking slightly up water-wise. 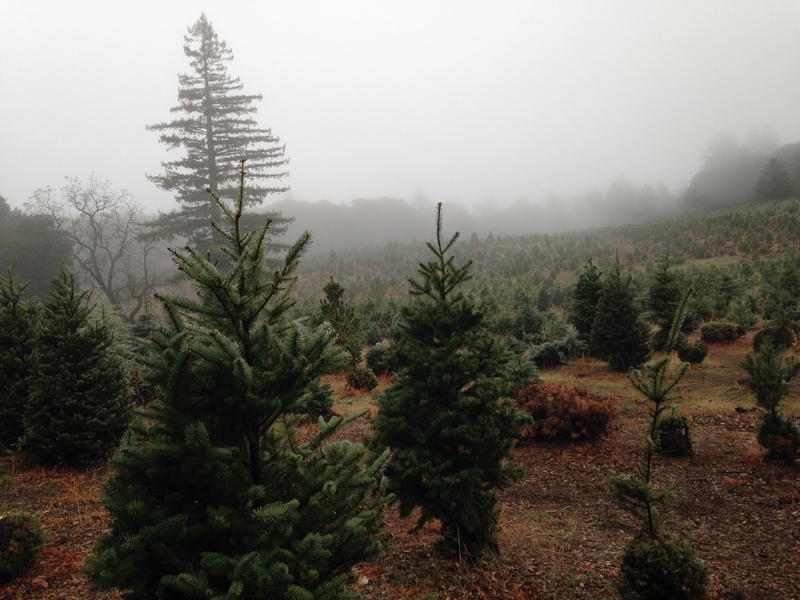 But when we went to cut our Christmas tree at a local farm, the drought was alive and well and causing problems. The trees were stunted and tiny. Accompanied by other forlorn families, we wandered through the acres, thinking that one or another of the trees on the horizon was going to be a tall one, only to realize, once we got closer, that our eyes had tricked us — again. So we went rogue this year. No pine, fir or spruce for us. Our tree farm offers some other, less conventional choices, and we chose one of them. A juniper. It’s a little shaggy and scraggly but at least it’s taller than I am. And if we’re channeling a bit of the Charlie Brown look this year, that’s okay… we’ll go with it! 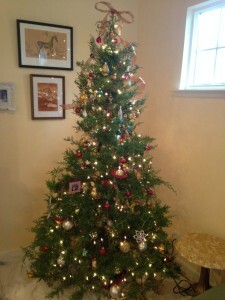 We could have gone to a tree-lot or a store, and our Christmas tree would be better looking. But it is the process of getting the tree that matters to us. Bundling up for the cold weather at the top of the mountains, running through the rows with our little dog, my middle-manager husband wielding the saw in wanna-be-lumberjack fashion, our young son hauling the tree behind him on the squeaky-wheeled cart — those are the things we’ll cherish long after the juniper has been turned into wood chips. Holidays are full of imperfections, right? Cookies burn, the unpredictable aunt or uncle has a wee bit too much to drink, someone forgets the cardinal rule of avoiding politics at the dinner table. 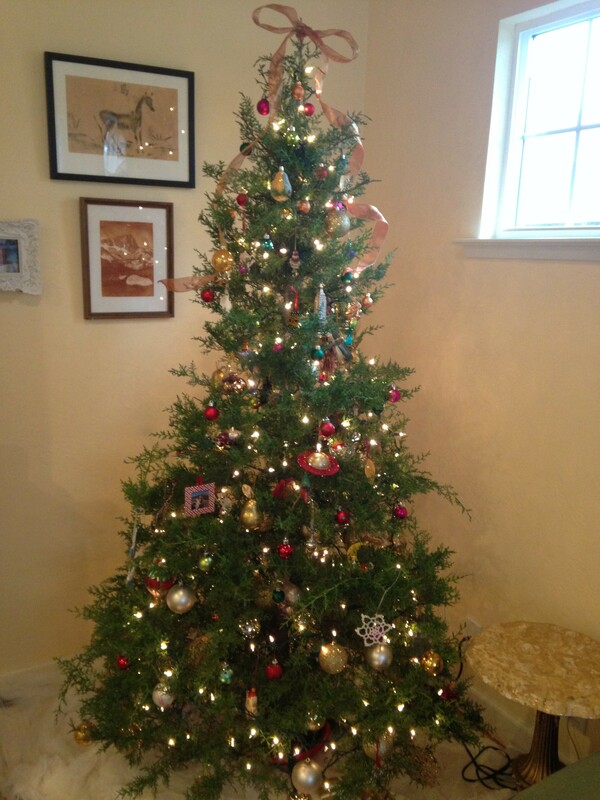 So we have a less-than-perfect tree and that’s okay. We had a great adventure trying to find it and it looks pretty cheerful all dressed up for Christmas. Happy Holidays, Everyone! May your holidays be fun and full of joy, despite any mishaps or imperfections along the way.